Despite the case of Chip Thomas aka Jetsonorama and Yote, most artists do not end up on street art blogs through dumb luck. Blogs with no regional focus like Wooster Collective and Vandalog get most of their content through submissions by artists, pr people and fans or by seeing the content after it’s been posted elsewhere on the internet. Even for regional blogs like Streets Dept or Hooked, which typically rely on photographers walking around and looking for street art or graffiti a few days a week, a clever artist can figure out spots where the editor photographer likes to look for art and then put their work in those locations. Or the artist can just email the blog to let the photographer know where their new work is. Most street art and graffiti fans will say there’s nothing better than walking around a section of town that they’ve never been before only to discover some work that they did not know was there, but those moments are not how most major blogs discover new work. For about the first two years Vandalog’s existence, I was based in London, where I made a point of walking around at least once a week to look at street art. That’s a large part of how I became educated about street art, and those walks influenced what was covered on Vandalog. But that didn’t have to be the case. In the fall of 2010, I moved to suburban Philadelphia where most of the street art is in the form of character-based sticker art adhered to newspaper bins, and street art is effectively nonexistent in the suburb where I live. It was quite a change. But I’m still able to run Vandalog. I still cover things that take place in London, Philadelphia, Cape Town, Los Angeles, New York, Berlin, Melbourne, Buenos Aires and elsewhere. Vandalog was able to continue relatively uninterrupted by my move because most of what I post about, even the London-related things that I posted about while I lived there, are things that I find out about through email, reading other blogs or checking various Flickr and Instagram accounts. Saying things like “London-based” is increasingly less relevant. Yes, it can help commercially-minded street artists to put up work in London or New York City, but putting up work in Cleveland or Mexico City can be successful too, as long as there’s a photo. 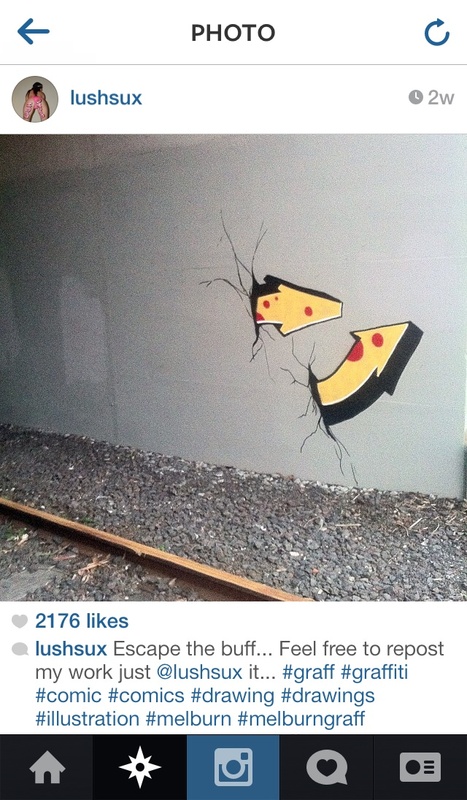 Today, the important locations for street art are IP addresses. Street artists have more to gain if something they do appears on all of the top five street art blogs than if they get up in five cities around the world without any online attention. Artists who find themselves in “the right places” online can reach a wide audience, build a strong fanbase and even sell work more effectively than even an artist in a major city whose work is ignored by the internet community. Depending on the spot hit, the type of intervention, and the reliability of the local graffiti removal squad, street art and graffiti can be extremely-short lasting, but a photo on a blog is comparatively permanent and can be seen around the world. And unlike the street where most people have no interest is examining the hidden scribblings on the walls of every alleyway, websites dedicated to street art or graffiti are generally visited by people who already have some interest in the work and documentation is presented in such a way that the work is highlighted. Websites and social media accounts can also assume the function of locations when the pages are run by the artists’ themselves, with artist-run pages a potential alternative to getting work photographed by documentarians. A website or social media account can function as an artist’s portfolio, while a blog or someone else’s Instagram account might only share one or two pieces by a given artist at a time. Once fans finds an artist’s site or social media profile, they have access to works the artist may have done in perhaps a dozen different countries over as many years. A screenshot taken November 11th, 2013 of a photo on Lush’s Instagram account. Photo by Lush, screenshot by RJ Rushmore. For artists like Lush, their fame and success is built online. That’s where his fans are and where their art exists best. Lush is from Australia, and he has painted across Australia, the USA and England, but his work is really only finished and out there for consumption on his Flickr, Instagram, Facebook and Tumblr pages, where his large audience of committed fans can be found. If anyone sees his pieces in person, that’s an added bonus. Lush is an extreme example, but more traditional street artists act similarly. Gaia lives in Baltimore and the locals love his work, but he posts nearly everything he does on his Flickr. Because he posts photos online, I’m as familiar with Gaia’s work as anyone in Baltimore or wherever he’s been painting. It matters very little whether Lush or Gaia paint in an abandoned factory outside of Pittsburgh or in downtown London. What matters is that they get the photo and post it online. While Thomas and Yote ended up on Wooster Collective thanks to a random fan’s photo, even they both posts their own photographs online. Thomas has his own blog, and Yote has a Tumblr. For many artists working outdoors, taking photos of their own work for the internet is an essential part of what they do because the photos disrupt the geographic constraint of street art and graffiti.